14 October 2014, Dhaka. It is a stylized fact that with rapid rural to urban migration of the population in the process of economic development the farm size gradually expands that facilitates adoption of labor saving technologies and growth of agricultural productivity and marketed surplus for the growing urban population. The history of agricultural development demonstrates that almost all of the present day developed countries in North America and Europe followed that process. The Asian agricultural development experience, however, seems to be an exception of that stylized fact. In Japan, South Korea and Taiwan that already went through the process of economic transformation; the farm size has hardly increased despite removing restrictions on the ceiling of landownership that was imposed after the World War II. Indeed, with on-going economic progress the farm size tends to get smaller in most countries in South and Southeast Asia, with the exception of Thailand, Pakistan and Northwestern India. Begum Matia Chowdhury, Honorable Agriculture Minister, People’s Republic of Bangladesh will be present as the Chief Guest of this international conference. President elect of ASAE and advisor to the Executive Director of BRAC, Dr. Mahabub Hossain will deliver his welcome speech. Presidential speech will be delivered by the Outgoing President of ASAE and the Philippine Socioeconomic Planning Secretary Dr. Arsenio Balisacan. Professor Dr. Joachim von Braun, Director of Center for Development Research (ZEF), University of Bonn will deliver the Keynote speech on “Small firms: large numbers, great diversity, big role”. It is expected that more than 250 representatives including policymakers, donor agencies, academicians, researchers and practitioners will participate in this conference. Due to the structural change in economy, Bangladesh has recently experienced a decreasing contribution of agricultural sector to its Gross Domestic Product (GDP). From the perspective of economic transformation; urbanization, migration and rural/agricultural sector are closely interlinked with each other. A substantive portion of the rural population is migrating internationally or internally in search of better paying jobs and several other reasons. Despite massive increase in land price, diversity is observed in land ownership and share cropping system instead of land selling. The number of small, medium, marginal and landless farmers is increasing compared to the large ones leading to an increase in the numbers of farms and a decrease in sizes. In the 1970s, like all other Asian countries, it became evident in Bangladesh that small farms are more productive than the large ones. On the contrary, according to the notion of economies of scale, this phenomenon will not bring in any positive impact in our agriculture. Small and marginal farmers, failing to meet their basic necessities by means of agriculture, are forced to rely on non-agricultural activities. This gives rise to agricultural diversity and multi-occupation. With the introduction of sophisticated technology at the very grass-root level, activities like- irrigation, sowing, harvesting, threshing and processing are getting highly institutionalized. Increasing trend in population growth is causing a sharp decrease in cultivable land, inequality of land-ownership, misuse of natural resources; climatic change, environmental degradation etc. We need to utilize information and communication technology for knowledge dissemination regarding the use of sophisticated technology, provide agricultural credit facility, relax the terms of trade in favor of agriculture and invest in the infrastructural sector. With a vision to turn Bangladesh into a middle income country and to resolve the problems in the agricultural sector in the 21st millennium, we need to adopt an agriculture friendly public policy to increase production and to ensure food security. 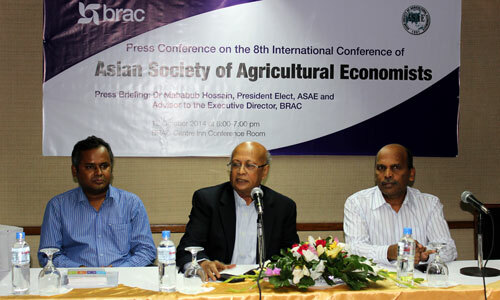 Under these circumstances, ASAE international conference is an epoch making initiative for Bangladesh.